CAPE CANAVERAL — The main engine rumbling to life. Ice shards breaking free. The rocket lumbering off the pad. The battle against gravity being won once again. That was the scene at 8:38 a.m. EST (1338 GMT) Friday morning as the United Launch Alliance Atlas 5 booster took flight to cap a generation of Global Positioning System satellites for the navigation network. Thick clouds and gusty winds from a passing cold front threatened to scuttle the launch throughout the overnight countdown. But, despite 70 percent odds of a scrub, the winds stayed in bounds just long enough and the clouds moved away soon enough to permit the liftoff to go ahead right on-time. 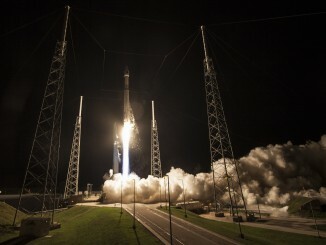 And after three hours of flight, good performance from the first stage and two firings of the Centaur upper stage, the black and gold GPS 2F-12 spacecraft was delivered exactly where it wanted to be 11,000 nautical miles above Earth in an orbit inclined 55 degrees to the equator to circle the planet twice each day. It was a successful yet sentimental sendoff for the last satellite in a remarkable 27-year legacy that has given a ubiquitous space technology to billions of users on planet Earth. “Today’s launch marks a momentous milestone in the history of the Global Positioning System. It is the twelfth and last GPS 2F satellite and closes out nearly 27 years of launches for the GPS Block 2 family of satellites,” said Col. Shawn Fairhurst, 45th Space Wing vice commander at Cape Canaveral and the Launch Decision Authority this morning. The GPS 2 era saw 60 satellites launched into orbit from 1989 through Friday to create and then maintain a worldwide utility for U.S. military forces and civilian users alike. “GPS will be there when you need it. Our goal is to deliver sustained, reliable GPS capabilities to users around the world. This is done by maintaining GPS performance, building new capabilities and developing more robust, modernized capabilities for the future,” said Col. Steve Whitney, director of the Air Force’s Global Positioning Systems Directorate. The Air Force estimates there are four billion GPS-enabled devices worldwide, a number that is expected to double in the next five years. “The Directorate here is currently engaged in a very aggressive campaign to modernize the GPS system across all three segments — space, ground and user equipment. The result of this campaign will result in stronger signals, additional civil signals and improved robustness of the overall system architecture,” Whitney said. The advanced GPS 3 era dawns next spring. Troops use GPS on land, at sea and in the air to provide precision, day or night, all-weather guidance and timing for aircraft, ships, tanks and smart-bombs. GPS signals help civilians find their way, keep outdoorsmen from getting lost, farmers to cultivate their fields with precision agriculture and give exact timing accuracy for everything from bank ATMs to credit card machines at the gas pump. “It is amazing how people continue to find new and innovative uses for the GPS signal,” said Micah Walter-Range, Space Foundation director of research and analysis, said in an Air Force press release. Measurements collected simultaneously from four satellites are processed to solve for the three dimensions of position, velocity and time. With the 2F satellites and the earlier 2R-Modernized series, the Air Force now has 18 satellites in space with the more robust military signal. “The October 2015 launch brought the 18th satellite on-orbit with this improved military signal. Eighteen satellites is significant because it allows us to have four satellites in view at all times, anywhere in the world,” said Whitney. After a research and development generation — GPS Block 1 — in the 1970s and 80s, the first operational satellite of the GPS 2 era launched on Feb. 14, 1989. The system advances to GPS 3 starting next year, with the first launch planned for May 2017 aboard a Delta 4 rocket. 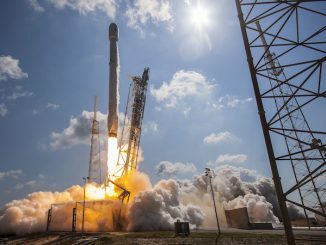 With the addition of the 2F satellites into the constellation, the accuracy of GPS has improved the so-called “user range error” from 90 cm to 42 cm. “Fifty centimeters can be the difference between the soldier, sailor, airman or Marine being in the right spot behind protection as he is taking fire or being in the right spot to deliver fire. Fifty centimeters is a lot,” said Whitney. The $245 million GPS 2F-12 satellite launched Friday morning should be checked out and ready for service in about a month. 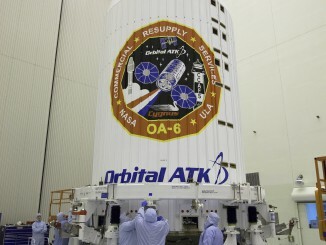 This is the 50th Boeing-built GPS satellite delivered to orbit. It will take the place of GPS 2R-6 satellite, launched in 2000, in Plane F, Slot 1 of the constellation. That Lockheed Martin-built satellite has outlived its 7.5-year design life and will shift to an alternate role within the constellation for its remaining years. In preparation for Friday’s launch, Air Force controllers were retiring the 25-year-old GPS 2A-10 satellite deployed in November 1990 to make room in the constellation for the newest member. The retirement will be completed by boosting the craft into a graveyard orbit later this year. There were 30 operational GPS satellites going into Friday’s launch, plus 9 older craft held in residual status as backups. “The GPS 2F satellite performance has been exceptional and is expected to be operational for years to come,” said Lt. Gen. Samuel Greaves, Space and Missile Systems Center commander and Air Force program executive officer for space. Friday marked the 132nd successful launch in a row for the Atlas program spanning more than two decades and the 61st for an Atlas 5. It was the 50th Atlas 5 to originate from Cape Canaveral, too. This launch debuted an avionics upgrade for the Atlas 5 with modernized and consolidated packages on the vehicle and updated software, ULA CEO Tory Bruno explained on Twitter. The upgrade is designed to reduce cost and improve reliability. 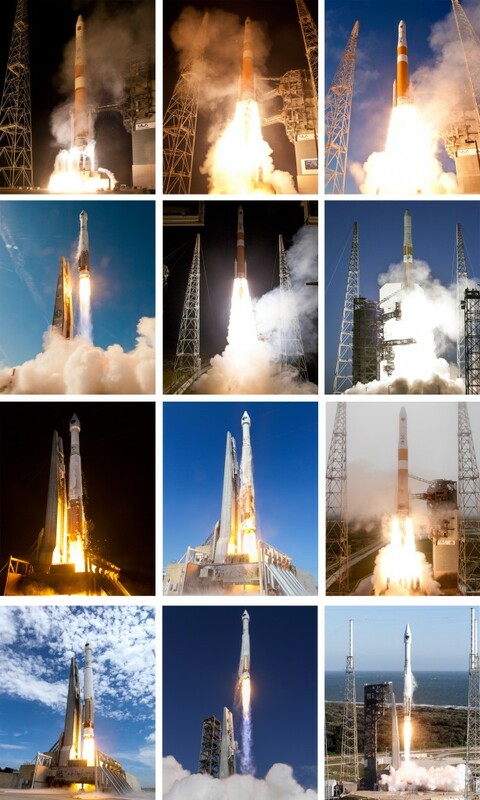 ULA has launched 104 times in 9 years, all successfully, and has 14 more flights planned this year. Next up will be a Delta 4 rocket with a classified National Reconnaissance Office payload from Vandenberg Air Force Base in California. The predawn liftoff is targeted for next Wednesday. The next Atlas from the Cape is planned for March 20, a tentative new date still being established, on the second of two commercial cargo resupply missions to the International Space Station in the span of 100 days. That flight has slipped about 10 days due to additional cargo processing needs of NASA, officials said Friday. The March 20 date, if affirmed, would have a 30-minute launch window opening at 12:18 a.m. EDT (0418 GMT).